As a lot of you know, I grew up in Alaska. I love my home state and I miss it all the time. Alaska is both totally unique and totally beautiful. It will always be my home, but when it come to fashion, Alaska isn’t exactly cutting edge. In fact, it always took a while for styles to filter there way up the 49th state. So, Julie of Paper Doll School, Boots of Popculture Looking Land, Miss Missy of Miss. Missy’s Paper Dolls and I decided on drawing a paper doll outfit from the year each of us graduate high school for the Collaborative Paper Doll 2017 Project. I graduated in 2003 and this is what I remember girls wearing. I have no idea if it really is what was in style in 2003 is the point I am trying to make. What I remember from that era (nearly 15 years ago which is crazy) is that the jeans were low rise and boot cut. The shirt were shorter and had tight sleeves. The shoes were heavy chunky boots. These are all the things I recall from my high school years and I decided to include them in today’s paper doll outfit celebrating the year I graduated high school back in 2003. Want to see more outfits from the Collaborative Paper Doll 2017 Project? Go check out Julie of Paper Doll School, Boots of Popculture Looking Land and Miss Missy of Miss. Missy’s Paper Dolls. They maybe posting their outfits in the next few days or today. The end of September snuck up on all of us. 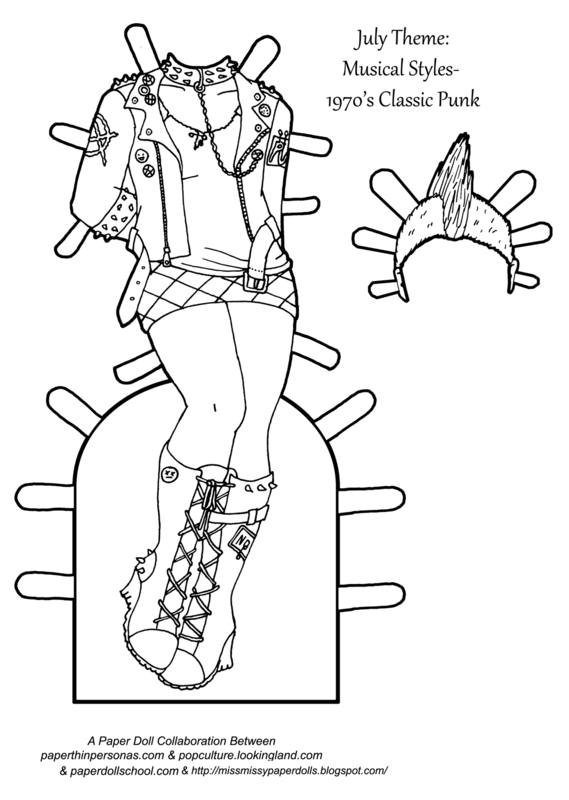 By the way, I feel like I should add that while I drew this paper doll outfit, I am in no way nostalgic for high school. There’s basically no force on this planet that would make me want to return to that period of my life. Seriously. As many of you know, this year on the last Friday of most months (we’ve also done the last day of the month), Julie of Paper Doll School, Boots of Popculture Looking Land, Miss Missy of Miss. 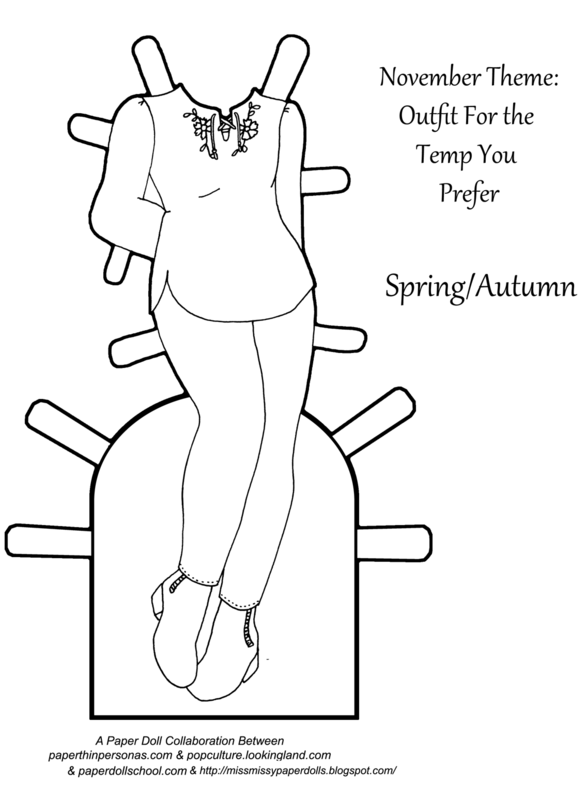 Missy’s Paper Dolls and I are all posting a black and white outfit for a shared paper doll. This has been such a rewarding project. I confess there were times I wondered if I would really get it done. And there have been times when I’ve wondered if we would stick with it. 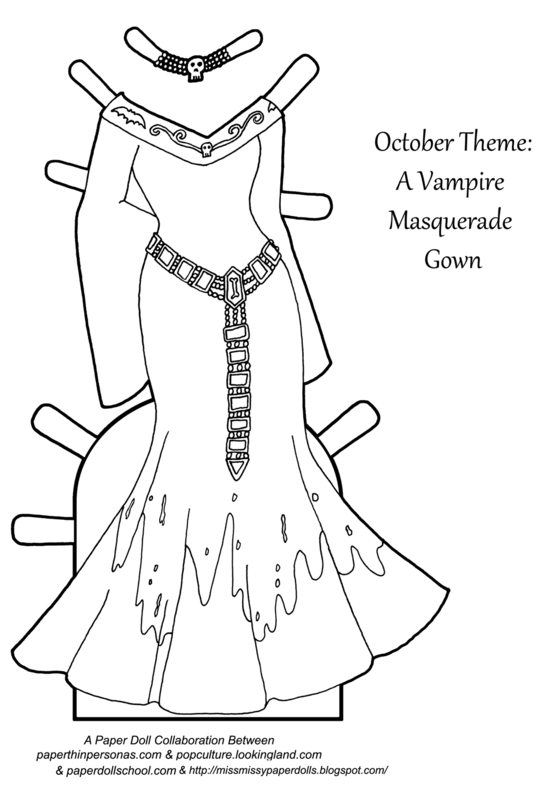 But, here we are in the 8th Month of the year, August, and here’s another paper doll outfit. So, today’s Collaborative Paper Doll 2017 Project theme was Favorite Historical Period. I chose the late 1920s. And choosing one historical era wasn’t easy, because I love all sorts of eras. I have so many favorites, I felt a little absurd being asked to pick just one. How could I decide? In the end, I chose the late 1920s, because it is an era I have loved for a long time. It is an era that I know I could never wear. I have both hips and a bust, which means the 1920s will never look good on me. I also chose it, because there was something about the base doll’s pose that reminded me of the 1920s, as well. So, here it is! 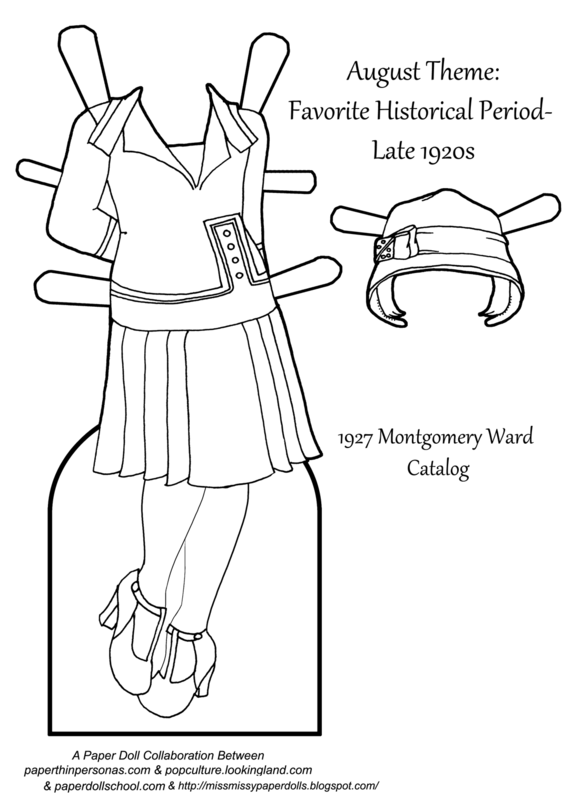 The dress was based on an illustration from the Montgomery Ward Catalog of 1927, sections of which are republished in the book, Montgomery Ward Fashions of the Twenties. I just got the book which is the other reason that I drew clothing from this era. This month’s Paper Doll Collaboration theme was was really fun. 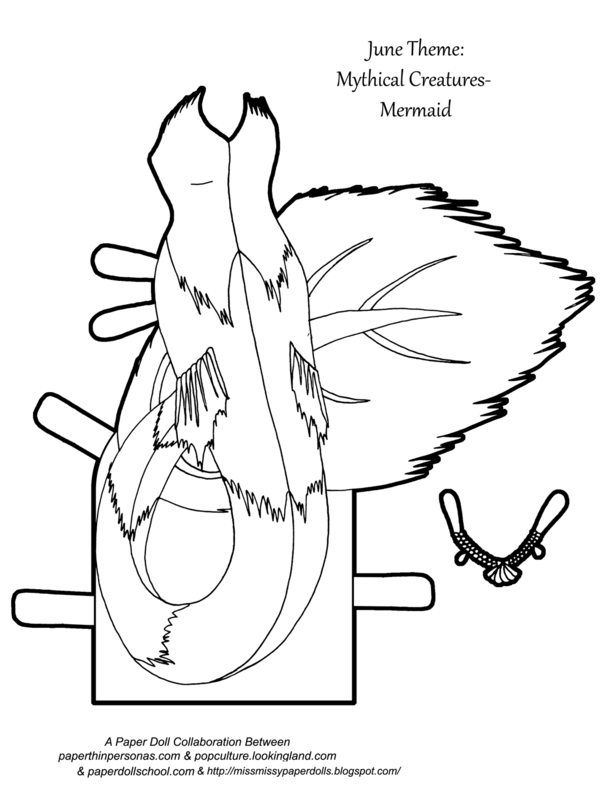 Head over to Paper Doll School, Popculture Looking Land and Miss. Missy’s Paper Dolls to see what other folks created to celebrate the theme.